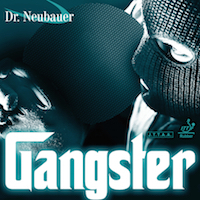 Has nobody tried or know anything about Gangster? Strange! I'm sure have seen those descriptions for the other Dr N long pips! Your right Iskandar I haven't got a clue. So it's not just the jargon around long pips and dr N it's all manufacturers. That's why this forum is so good players will give there honest opinion but even then what suits one player doesn't suit another. Even when we find a long pimple we like we still look for that holy grail which I am beginning to realise doesn't exists and it's cost me a fortune along the way. But you never know the Gangster might be the one!!!!!! Here I go again!!! The sheet of Gangster has arrived!! I got the sheet in red ox (no sponge) its placed on the backhand of a Dr N Barricade blade with Dr N Terminator (ox) black on the forehand. This is a very light set up weighing in complete at 90 grams! thats the same weight as most blades without the rubber on! As you can see the rubber sheet is very thin (for a ox) in fact its so thin you can see through it almost as well as a window! because of this the pips are very very soft and flexible, from an initial bounce on the bat its feels slow! a lot slower in comparison to the Terminator on the other side, sorry i know thats not exactly a good reference, however i can't really compare to Viper (ox) & Desperado (ox) as there on a faster blade (Jackpot & Kung FU) however it does feel a lot softer and more flexible than them. Im looking forward to getting on the table and seeing what destruction this causes to my opponents loops i will update once tested on the table. Its not the hardest pips I've had to glue but take your time and be careful! Glad your looking forward to the review, unfortunately i haven't had chance to test properly yet but i will have a proper test and do a review this coming week. I will say from the brief go i was surprised by the wobble! the ball was allover the place I'm looking forward to giving this a proper go, in fact the whole set up (barricade, Gangster ox & Terminator ox) I'm really looking forward to this, tempted to use this hardbat next season but before i will make that decision i will test further. Has anyone tried the Gangster yet?